Some MCU fans have been confused as to when each Marvel movie takes place. Well, now you don't have to worry about any time discrepancies or conceived plot holes based on when and where some of these stories take place. Marvel has mapped it all out, with a clearly defined year for each adventure. The official timeline comes from the Marvel Studios: The First 10 Years sourcebook. And it's helping to clear up any confusion about when certain things happened between the first MCU movie in 2008, which was the mega-blockbuster Iron Man, and the second to last released movie, which is this past summer's Infinity War. 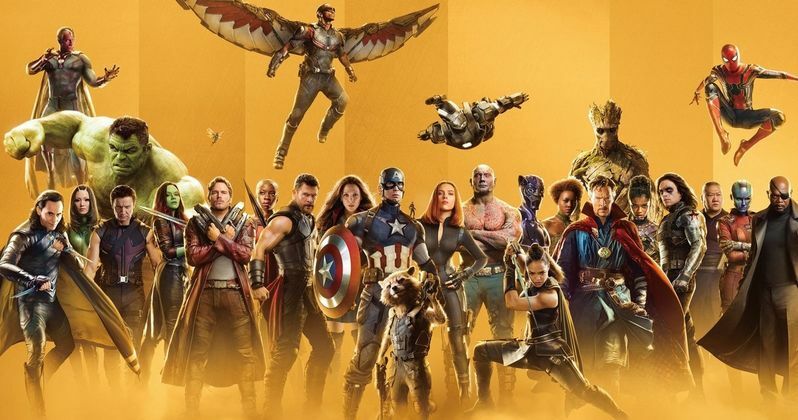 Here is how 18 of the 19 movies thus far released fall into place, giving fans the perfect order to watch them all over again before seeing Avengers 4 this summer. Related: Avengers: Endgame TV Spot Reveals the Mystery of the Missing Character? Publisher Titan is behind the book Marvel Studios: The First 10 Years. And they were pretty smart to include this official timeline of events. Fans are able to explore the entire history of what's happened, and more importantly, when it happened, leading up to the events seen in Avengers: Infinity War. It's interesting to note that Iron Man took place two years into the future of the actual date it was released. This timeline also indicates that the events of Iron Man 2 and the first Thor movie were happening simultaneously within the same year. It was previously revealed by director James Gunn that the first two Guardians of the Galaxy movies took place pretty close to each other, with both storylines taking place in 2014. That means four years passed between Guardians of the Galaxy Vol. 2 and Infinity War. It's expected that Avengers 4 will feature a very significant time jump, where we will see a more mature Cassandra Lang taking over for her dad Scott Lang, aka Ant-Man, and a future where Tony Stark and Pepper Potts are married and have a kid. But none of that has been confirmed. It's also expected that Avengers 4 will go back through time to visit key moments from some of these movies, altering what we already know to be the MCU. The one movie not listed in the official MCU timeline is Ant-Man and the Wasp. We know it takes place two years after Captain America: Civil War, which would place it in 2018. But the post-credit scene lines up with the events in Infinity War, which according to this timeline, takes place in 2017. There is also a time jump between the actual end of Ant-Man 2 and the post-credit scene, but that is expected to be only weeks, if not days, from what we see happening in the movie. Dialogue in infinity War also indicates that it has happened 2 years after Civil War. While this timeline has been put into place to solve some continuity issues, it appears to be creating new ones. None of the Netflix MCU series, such as Daredevil, Jessica Jones and The Punisher are mentioned. Neither is ABC's Agents of Shield. That's a whole other headache in and of itself. It appears that the official MCU timeline has helped balance some of this universe. But it's also still a little wonky around the edges. Screen Rant pulled the timeline from the book to share with everyone.